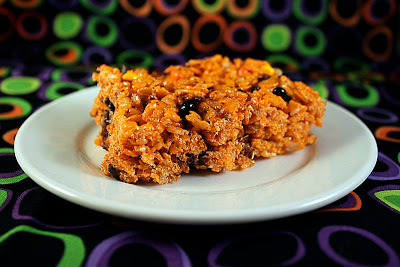 Sometimes, a Rice Krispie treat just hits the spot. I haven't made them in a long time, and it's not like they're hard, but I never think to make them. They seemed like the perfect easy Halloween treat, though. These are basic Rice Krispies with chocolate-covered sunflower seeds and chocolate chips mixed in. And obviously some orange. Okay, once again, not Halloween. 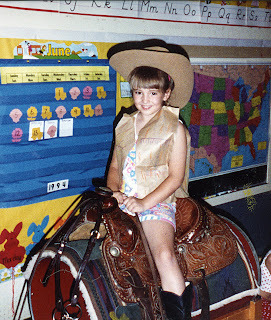 But still, I was a pretty resourceful cowgirl, what with my paper bag vest. Right? I wish I knew what year in school this was, but I really have no idea. Maybe I'll just do this for a costume this year. At least it would be cheap! Ingredients of a 20something by Brenna Hawley is licensed under a Creative Commons Attribution-NonCommercial-NoDerivs 3.0 Unported License. Based on a work at ingredientsofa20something.com.